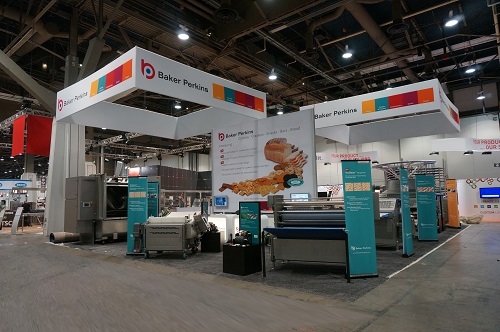 A range of mixers to handle every type of cookie and cracker dough was introduced to the North American market by Baker Perkins at IBIE 2013. The HS (High-Speed) range of multi-purpose mixers features a unique, shaftless mixer blade ensuring efficient dispersion and rapid dough development, cleaner discharge, the elimination of blade fatigue and cracking, and improved hygiene. Delicate inclusions are incorporated evenly without damage or smearing. Loading and discharge are fully automatic to reduce labor costs and mix cycle times. Full discharge is achieved without manual intervention by a bowl tilt of 150°, and because there is no shaft to obstruct the dough. As well as better mixing and automatic discharge, the shaftless design has a number of other advantages over traditional mixers using blades with shafts. Because centre shafts rotate very slowly, ingredients and partially mixed dough that adhere to them are not dislodged, and have to be removed manually. In addition, welded shaft and blade assemblies are prone to fatigue and cracking; the shaft also tends to flex, creating seal wear and leakage from the bearings. A new option allows the mixer to tilt backwards so that minor ingredients can be added from behind when required by the plant layout – typically when discharge is to a power dough feeder that restricts access to the front of the mixer. A version that tilts further to allow rear discharge of reject dough is planned. Simple controls make this an easy machine to operate, and the crevice-free bowl, shaftless blade and easy access minimize cleaning requirements. 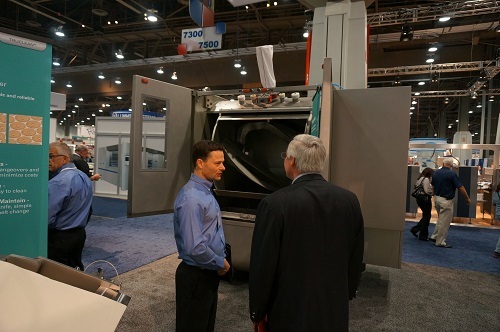 Major components are designed to last for the life of the machine, reducing maintenance costs. Three models provide nominal batch capacities from 1,435 to 2,870 lb (650 to 1300 kg) on soft dough, and from 1,145 to 2,670 lb (520 to 1210 kg) on hard dough. Because HS mixers operate successfully on small batches an HS mixer can be specified for any output capacity over 200kg.